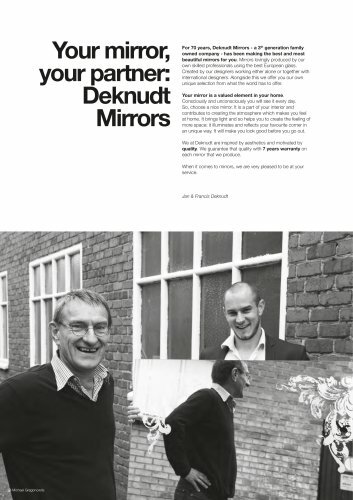 Your mirror, your partner: Deknudt Mirrors For 70 years, Deknudt Mirrors - a 3th generation family owned company - has been making the best and most beautiful mirrors for you. Mirrors lovingly produced by our own skilled professionals using the best European glass. Created by our designers working either alone or together with international designers. Alongside this we offer you our own unique selection from what the world has to offer. Your mirror is a valued element in your home. Consciously and unconsciously you will see it every day. So, choose a nice mirror. It is a part of your interior and contributes to creating the atmosphere which makes you feel at home. It brings light and so helps you to create the feeling of more space; it illuminates and reflects your favourite corner in an unique way. It will make you look good before you go out. We at Deknudt are inspired by aesthetics and motivated by quality. We guarantee that quality with 7 years warranty on each mirror that we produce. When it comes to mirrors, we are very pleased to be at your service.